While yellow-vested protesters aren’t clogging the Davos Promenade, the French movement’s presence was felt on the World Economic Forum’s stages and backrooms. And at least one European government, Italy’s, made the case for policies that might as well be called gilet-ist. 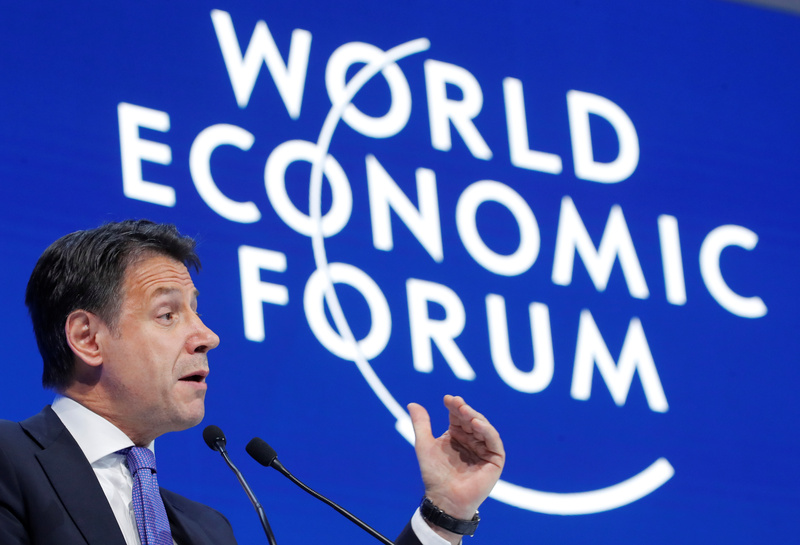 Italy's Prime Minister Giuseppe Conte gestures during the World Economic Forum (WEF) annual meeting in Davos, Switzerland, January 23, 2019. France wants to push during its presidency of the Group of Seven for a global taxation system including a minimum corporate tax at world level, Finance Minister Bruno Le Maire said on Jan. 24. Le Maire told the World Economic Forum in Davos this was needed to address imbalances among the taxes paid by big and small companies. He said he had discussed the idea with the United States. "There is a common understanding among all G7 members that we need a new taxation system," he said.